Twin Cities Gamer: I'm a winner! The other day, I clicked into Ray Rousell's wonderful Dont' throw a 1 blog and saw my mug staring back at me. I'd won his drawing for free painting services! The picture was cropped from my blogging avatar, which my kids tell me is just horrible and sad. And here it is, posted up on a blog with 670+ followers. Every winner starts by saying they never win anything and it's true...I never win anything. Just thumb through my AARs for proof! So I was very excited to win free painting services from Ray's Battleaxe Painting Service. A funny thing happened on my way to collect my prize. I saw that another blogger had stuffed the ballot box but for a very good cause. She'd acquired some gorgeous SYW models just for Ray to paint up. All I have on hand are 28mm Saga figures and as I thought it over, I couldn't stand in the way of a brilliant idea. Ray obligingly allowed me to transfer my prize (but not my good luck) to Anne of Anne's Attic. As a quick aside, she has a hilarious sendup on the selection of an Irish pope that will split your sides. The Irish have special dispensation from the Holy See to be irreverent once a year and she's used it well. So thank you Ray for your blog, your humor and the prize! 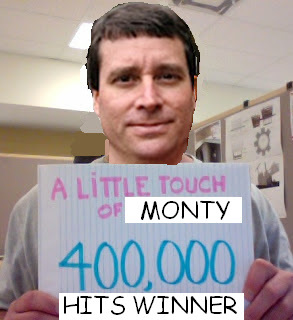 And congrats on 400K hits. The rest of us can only dream. Congratulations and very generous of you to transfer your prize to Anne who I'm sure will be delighted. Congrats on the win and what a great display of generosity you've shown in passing the prize over to Anne. I'd said on my (10) entries to the draw that if I won, I'd pass it to her as she was sure to come up with something really stretching for Ray to paint, but I wasn't expecting SYW figures (unless they happened to be of the Eureka teddy bear variety!). Congrats, generous and lucky man! All the best, Lord Monty! Nice one Monty!!! I think Anne's got them in the post already!!!! Very cool!!! What a guy! Thank you Monty!!! I very much appreciate it and am looking forward to seeing Ray paint them up. I think he's going to paint up the mounted knight as well. It's a gorgeous figure. Neat story and great picture. By the way you are always a winner in my book! You're the best! And thanks too. A man is always in need of karma points. Or at least, I am!